For centuries, sweeping skirts and tight corsets dominated British womenswear. The war in 1914 changed this. As men left to fight, around 1.5 million women took up work, on buses, in factories, as ambulance drivers and window cleaners, and as their roles in society shifted, so – by necessity – did the clothes they wore. Fashion & Freedom, a new exhibition at Manchester Art Gallery, explores this transformation through fashion and film. Designer Karin Human was inspired by the ‘Suffrajitsu’, martial-arts trained Suffragettes who formed protective walls around Emmeline Pankhurst during marches. ‘Anywhere Emmeline went, the jiu jitsu’s would follow her,’ says Vydelingum. ‘If they were in a demonstration and needed to get her out quickly, they would surround her and march her out.’ Human’s dress of cotton, leather and nylon contains large pockets for tools and weapons – which the suffrajitsu would have needed. UPDATE: unfortunately, the tabletopzen.com site that used to host our free online version of Suffragetto, as described in this post, has not been operational for a long time. Therefore, the online version of the game is not currently available. We still have all the assets and do plan to re-launch the game online at some point in the future. Tony Wolf, the author of the Suffrajitsu graphic novel trilogy, has created a free, online version of the Suffragetto board game. This recently re-discovered game, first published circa 1909, pits radical suffragettes against police constables in the mean streets of Edwardian London. The game requires two players, who can be signed in on two different computers. At least one player must create a free account at http://tabletopzen.com. Sign in and then click on the Suffragetto board in the Game Library. Study the rules (also listed below in this post) and then click on “Create Table” to generate a unique table for your game, with the pieces already properly arranged on the board. You may need to re-size the game board using Ctrl and – to fit your screen size. You can now send the other player the URL for your table and they will then be able to join the game simply by creating a nickname. Alternatively, if you are both signed in to tabletopzen.com, they can also join the game via the “Active Game Tables” screen in the Lobby. Use your cursor to move the pieces. If you and the other player are using remote computers, it’s easy and fun to chat while you play using Skype or any similar service. Closely based on the original 1909 board game, Suffragetto represents the street battles fought between radical suffragettes and police constables in London during the years leading up to World War 1. The original game was created by the Women’s Social and Political Union and manufactured by Sargeant Bros., Ltd.
Fun fact: there was a real-life secret society of martial arts-trained female bodyguards who protected the leaders of the suffragette movement. Their escapades also inspired the 2015 graphic novel trilogy Suffrajitsu: Mrs. Pankhurst’s Amazons; see www.suffrajitsu.com for details! Suffragetto is a contest of occupation between two opposing factions, The Suffragettes and The Police. The goal of the Suffragettes is to break past Police lines and enter the House of Commons. At the same time, The Suffragettes must also prevent the Police from entering Albert Hall. It is the Police Force’s duty to break up a meeting of the Suffragettes, currently being held in Albert Hall, all the while, preventing the Suffragettes from entering the House of Commons. 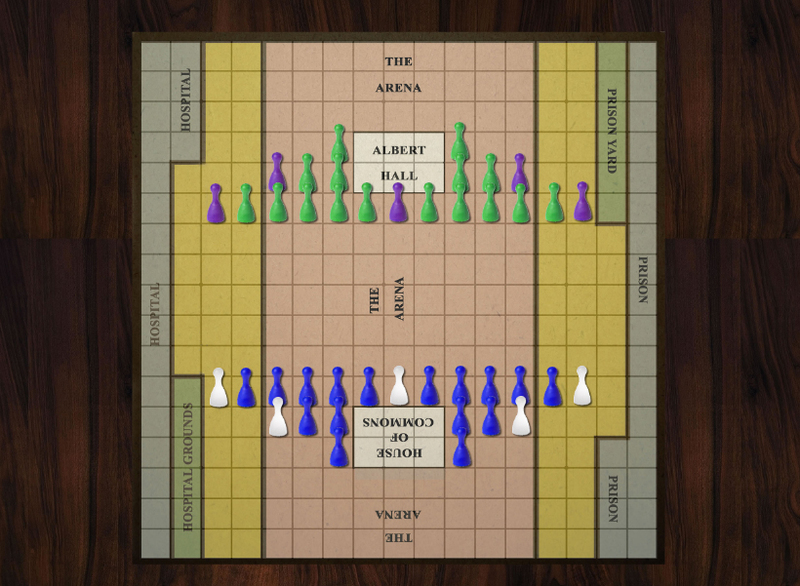 The game is won by whoever first succeeds in introducing six members into the building guarded by its opponents. The game is for two players, each of whom has 21 pieces, representing the Suffragettes and the Police. A coin toss determines the first player. The rank-and-file Suffragettes are colored green, and the purple pieces are distinguished as Leaders of the Suffragette Party. The rank-and-file Police Constables are colored dark blue, and the white pieces are distinguished as Inspectors of Police. The Suffragettes are placed on the squares marked ‘S’ near ‘Albert Hall.’ The leaders of the party are positioned as follows: one Leader is placed in the middle of the front row, and the other four Leaders are placed at the ends of the front and second rows. The Police Force is placed upon the squares marked ‘P’ near the House of Commons. One Inspector is placed in the middle of the front row, and the remaining four Inspectors at the ends of the front and second rows. Each player alternatively moves or hops one of their own pieces. Moving can result in moving to one space into a single adjacent square, hopping over your own pieces to move farther along the board, or hopping over an opponent’s piece to “arrest” or “disable” your opponent’s piece. A piece may move horizontally or diagonally one square per turn into any of the 8 adjoining squares, as long as that square is unoccupied. a. No piece can be moved (except when arrested or disabled) onto the spaces marked Prison, Prison Yard, Hospital, or Hospital Grounds. b. A Suffragette cannot move onto the spaces marked Albert Hall. c. A Policeman cannot move onto the spaces marked House of Commons. On a player’s turn, they may hop a piece rather than move it a single square. Hopping means jumping over one of your own pieces into the unoccupied square on the other side of the hopped over piece (as in Checkers). A player may string together hops into multiple jumps, provided that each jump lands in a permitted zone (as listed above) and there is a space in between each piece hopped over. If the square behind a piece is occupied, the hop cannot be completed. 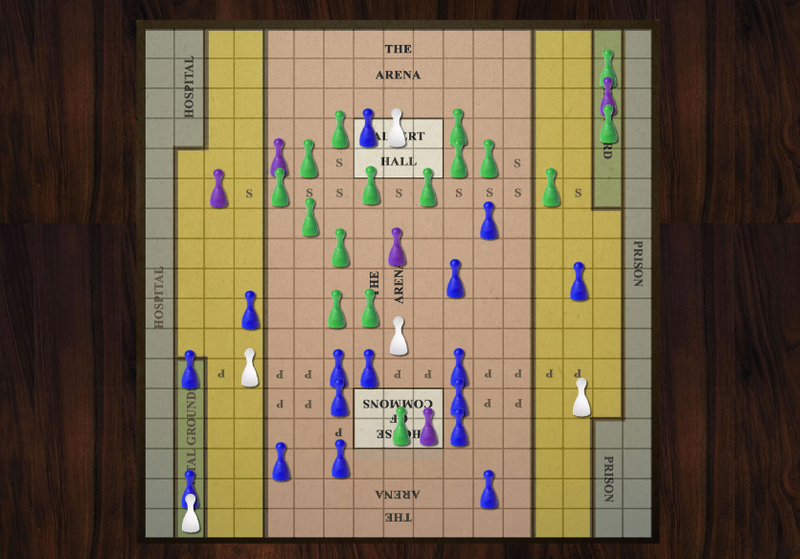 Any piece having gained entrance into their opponent’s House of Commons or Albert Hall may move about freely on the squares representing the building, but must not move or hop away from those squares. Moving within either the House of Commons or Albert Hall spends a player’s turn. Properly hopping over your opponent’s pieces results in arresting or disabling your opponent’s piece(s). Police may arrest Suffragettes and Suffragettes may disable Police. Any piece standing on one of the squares in The Arena (squares marked pink) is liable to be arrested or disabled by their opponent. Any of your pieces may arrest or disable any of your opponent’s pieces. A rank-and-file Suffragette disables the Police by hopping over him in a diagonal direction. A Leader of the Suffragette Party can disable any member of the Police Force by hopping over him in any direction. A rank-and-file Policeman arrests a Suffragette by hopping over her in a diagonal direction. An Inspector of Police arrests any Suffragette member by hopping over her in any direction. A piece can only arrest or disable its opponents when it is hopping, not when simply moving. Thus, one of the smaller pieces may hop over a Leader or Inspector simply to move about the board. A single piece may arrest or disable multiple pieces during one series of jumps. Suffragettes who are arrested are moved to the Prison. Police who are disabled are moved to the Hospital. No piece can be arrested or disabled in the yellow zones outside the Arena, but may move or hop freely in these zones. If at any point, the Prison and the Hospital each contain 12 or more inmates, either player may insist on an exchange of 6 or less pieces. The pieces exchanged must be of equal value, e.g., a Leader is exchanged for an Inspector, and the rank-and-file of the Suffragette party for the rank-and-file of the Police. The exchanged pieces may start moving from the squares marked ‘Prison Yard’ and ‘Hospital Grounds’ respectively. No exchange can be made while any piece remains on the Prison Yard or the Hospital Grounds. If one player does not agree to an exchange, the exchange does not occur. The first player with six pieces in their opponent’s home base wins.